On Saturday,the world is invited to celebrate the first annual International Observe theMoon Night. And all you have to do to take part is look up. 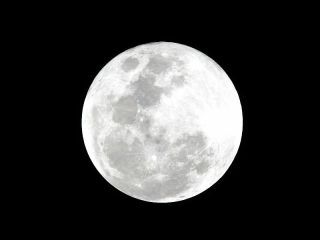 "One ofthe primary goals of the night is just to get people exposed to what'shappening at the moon," Noah Petro, a lunar scientist at NASA's GoddardSpace Flight Center in Greenbelt, Md., and an associate project scientist forthe LunarReconnaissance Orbiter (LRO) mission, told SPACE.com. "We want to getpeople talking about current U.S. and internationalmissions,why the moon is important and what we do and don't know about the moon." Tocommemorate LRO's successful journey to orbit the moon last year, Goddard'seducation and outreach team hosted an event called "We're at theMoon!" in Aug. 2009. The event coincided with "National Observe theMoon Night," hosted at NASA's Ames Research Center in Moffett Field,Calif. "Thegoal of both of these events was similar: engage the local public and amateurastronomer communities in an event to raise awareness of NASA?s involvement in lunar researchand exploration," said Doris Daou, directorof communications and outreach at the NASA Lunar Science Institute in MoffettField, Calif. "The events were so successful we?ve decided to do itagain ? only better and much, much bigger." This year,there will be 278 moon-watching events in more than 40 countries, includingChina, Germany and Egypt. Several NASA centers, such as Goddard, Ames andMarshall Space Flight Center in Huntsville, Ala., will be hosting publicevents. "I feellike we all take the moon for granted, so this is an opportunity for everyoneto learn a little bit about our neighbor," Petro said. "There are alot of people who are curious about the moon but don't have their ownhigh-powered telescopes or don't know much about the LRO mission. This willhelp people understand why it's important to have a mission there and whatwe're learning from it." Petro's ownpassion for the moon is much more personal ? his father was an engineer whoworked on the Apollo missions, so Petro's own work is "keeping with thefamily business." As ascientist, Petro sees the moon as a valuable science target, where featureslike the impactcraters that dot the lunar surface act as an archive of cosmic events. "Ithink of the moon as the Earth's attic," Petro explained. "The moonhas recorded the entire history of events of our solar system. By studying themoon, we get this window into the ancient path of Earth'sown history. "The event is also an opportunity to celebrate theprogress that has already been made in lunar science and exploration, and toreflect on the profound connection between our planet and its satellite,scientists said. "Youlook at the pictures coming back, and they're amazingly beautiful," Petrosaid. "It looks so alien and so foreign to us, but humans have been there? humans have walked around on that surface."